There is only so much we can do with the urban panning? Move cafes to the rooftops, leave the city center only for taxis? Start using bikes in the city. What remains in the city that never sleeps aka *NYC* are the yellow cabs. As I have gotten used to them in everyday life, I thought to invent something that would describe my mindscape, or, rather, imagine together with the cabs. One rainy day I figured that the rain looked like yellow. The yellow rain landed on our coats, we hurried as usual, yet something was different. It was perhaps the awakening to the spring, the anticipation, or coming into this realization that the colors are there around us. The everyday is packed with shapes, colors, lived and animated livelihood, art, design. Anything. I love one thing, *pink*. Now, when That color arrives in the city, occupying the busy business and residential avenue of New York, something Is in the Air. Last year this extravaganza color paraded a good amount of time on the street called the Park Avenue. Will Ryman’s Roses created from fiberglass and stainless steel, and thus having a naive and almost clumsy look in them, were just lovely vitamin for the city. Imagine pink and red roses in gigantic size, and then the bugs on top of them. 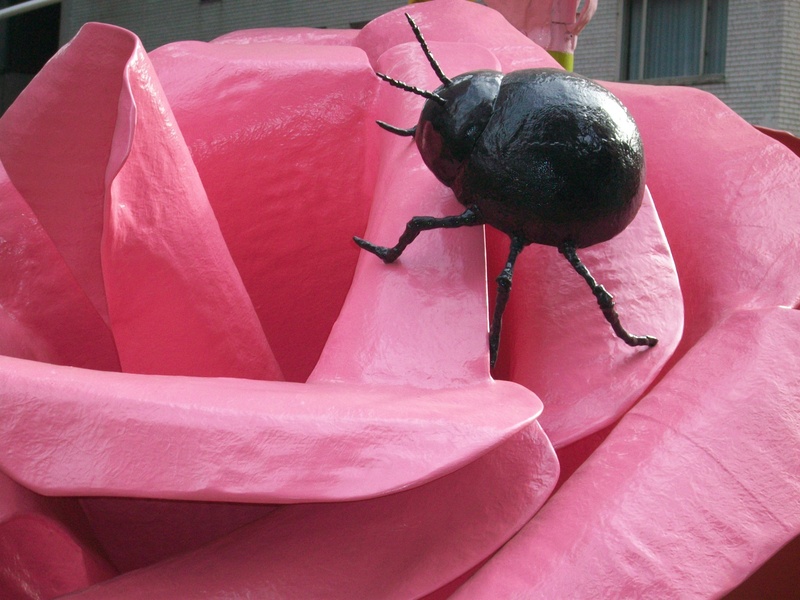 Ryman’s roses were attractive, and most importantly, I found my favorite bug. I had a reason to walk the street over and over again. I had a reason to think that the city is beautiful even on a rainy day when windgusts are kissing my back, when my mind is somewhere far away thinking of the faraway places of the wildest unconquered nature. Here my gigantic bug was making my day happy, and making a boring and secured street plan look childish and funny, a little bit tilted even. It is surprising what art can make out of the convenience of the everyday as it mixes with more serious urban plans. Only a Spider by my favorite artist Louise Bourgeois would make me happier, if I met one on a street corner of course.